Tons of custom attachment options for accessories. The Bottom Line: A fairly well designed, understated, and bombproof backpack designed for the adventurous photographer looking to haul their gear further off the beaten path. My biggest complaint is the dual function lid that luckily can be left at home. The Mountainsmith Tanuck 40L. Photo by Jason Leach. There are a variety of photo carrying options out there for the adventurous photographer, and they come in all shapes and sizes. I used to use a small 20-liter bag made by F-Stop, a premier brand in the photography space. My biggest complaint was that it carried photo gear and nothing else. The bigger packs from F-Stop came with a huge price jump that I wasn't ready to make, so I stuck with my small pack and Peak Capture Clip to make things work. Last year Mountainsmith launched a new line of photo gear designed by professional photographer Chris Burkard. I had looked at their photo gear in the past, but I had written them off because they seemed designed for more urban adventures rather than the backcountry. The new line seemed to be more fitting for my needs, so I took another look. Part of the "Tough As Nails," series the Tanack 40L backpack is part of a set of gear designed to work with one another. These include kit cubes of various sizes, the Tanack 10L Lumbar Pack, and the TanuckLite backpack, which appears to solve my biggest complaint. The first thing you will notice about the Tanuck 40L is the fabric and construction. This thing looks and feels like it can withstand being hucked off a cliff, dragged along rocks up a climb, or trampled by a moose and still look new. Most of the pack is made of CORDURA® fabric, which is known to be extremely durable and tear resistant. I have lugged this pack on many hikes here in the Front Range, the Rockies, and even up Angels Landing in Zion National Park. I have thrown it down among rocks, dropped it, and had it walked on by my dog. The pack still looks brand new after eight months of hard use. I attribute some of this to the fact that I got the pack in black. Generally I prefer my gear to be bright colors to show up better in photos, but in this case I am happy with the black color as it seems to keep the pack looking new. This pack looks very understated. None of the Mountainsmith line of camera packs come in a flashy color. For a photographer looking to do some traveling, this can certainly be an advantage to have you gear look "ordinary." In contrast, my F-Stop pack is a bright blue color, which is great for photos but not very discrete. The bottom of the pack has a raised rigid rand sewn around it with two elastic straps for a tripod. This rand allows the pack to stand upright on its own. This is a unique feature that I have not seen in any packs before. Perhaps it is how I pack my pack, but I have to be very intentional about standing it up if I want it to remain upright. Generally I throw my pack down and it falls over, which is not a major issue, but I wonder about its usefulness. 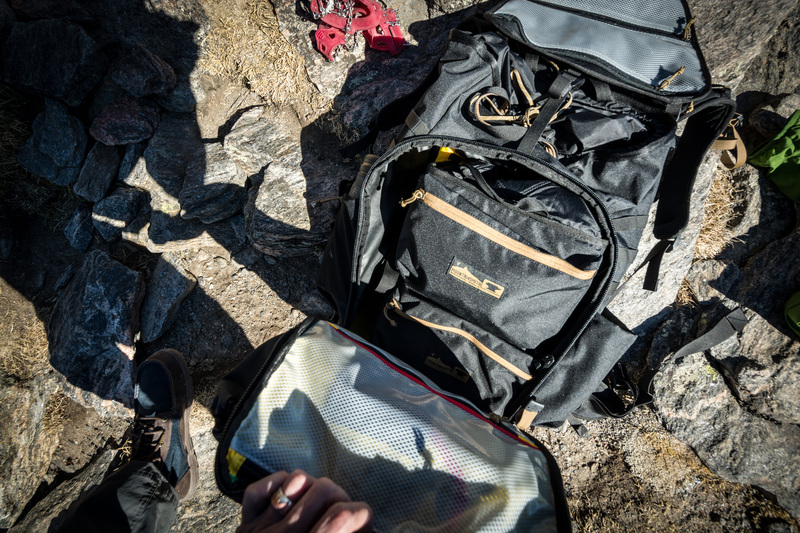 The pack has a front access panel that unzips so that a user can access the main compartment without needing to dig down through the top. I believe the purpose of the rand was to allow the user to use this flap more easily, but I have found it easiest to just lay the pack down on the ground rather than keeping it upright. The front zippered flap is not a something I generally enjoy on a backpacking pack. However, on this pack it is a convenient way to access your gear without digging through the pack. This intentional design also works nicely if you use the camera kit cubes that Mountainsmith sells to protect your gear. You can easily stow them toward the middle of your back for load balancing and retrieve them without needing to take all of the rest of your pack contents out. On the flap itself are two burly pockets for some small accessories. They seem to be water resistant, but I have yet to try dunking the pack in water to test this. Outside the zippered flap is a non-mesh shove-it pocket with a drawstring, flap, and interior cord pocket. I have used this pocket to store everything from gloves and bear spray to a jacket, and even camera lenses that I wanted to easily access. The pocket is large and very versatile. Most shove-it pockets tend to be stretchy mesh, which is great, but in this case it is nice to know this pocket can withstand the same abuse that the rest of the pack can. The pocket is sized well enough that you won't miss the stretchiness of traditional mesh shove-it pockets. This burly design was also woven into the side pockets. While one is mesh and the other fully fabric, the mesh stretch pocket has a line of fabric down the middle that appears to add to its durability. Both pockets have elastic draw strings and are sized perfectly to fit a tripod, swallow a Nalgene, or even fit a pair of crampons in. The rest of the pack is fairly straightforward. The pack has an extendable sleeve to fit all manner of photo or camping gear for an overnight or ultralight few days. The waist belt is removable, but I do not see a reason to do this. The waist belt itself is comfortable and helps balance the load in the backpack. There are a few adjustment straps on the waist belt as well as the backpack straps to fine tune your load, but otherwise the carrying setup is basic yet comfortable. I separated my shoulder in a bike crash a few years back and tend to prefer well-padded backpack straps, which the Tanuck thankfully has. The back panel is minimal but comfortable. It rides close to the back, which means that there does not seem to be great airflow, and I often found the back of my shirt to be a bit wet with sweat when ascending. There are tons of attachment points on the pack. It appears to be laced with webbing throughout, which would allow the user to easily customize the pack to fit even more stuff with a bit of creativity. It includes three D-Rings along the back panel for attaching the lid at different points and a set of D-rings on the backpack straps themselves to use the lid as a quick access pocket to carry your camera in front of you and ready to go, which brings me to my biggest complaint about the pack: the lid. The lid does not ever seem to stay properly tensioned down. I suppose if I packed the Tanuck to the gills I could get it to tension down. I generally use the lowest D-Ring on the back panel and pull the front tension strap as tight as it can go. Nevertheless, I find that the lid will still slide around as I hike. Nothing I have done seems to get it to remain secure. It also doubles as a camera holder. The D-rings on the backpack straps allow you to attach the lid in front of you and then use it to hold your camera. This is great in theory, but if you are frequently taking your pack off, you need to unclip the lid on at least one side and be hyper vigilant about where you set your pack down so you don't have the pack land on your camera. This gets to be annoying throughout a given adventure and is my least favorite feature of the pack. I tend to like things to make my travels more efficient, and sadly this feature does not. I will note that the new TanuckLite appears to have a more traditional lid, which might help solve this problem. All and all the Tanuck is a solid (albeit heavy) pack that will withstand tons of abuse. With the addition of some kit cubes, you'll have a durable and well-rounded backpack to carry a lot of your photo gear into the backcountry along with an overnight camping setup. On a final note - while I have not had any issues with this pack, I snapped my Mountainsmith trekking pole when I fell on it a few months back and they were quick to send me a replacement, no questions asked. I have high respect for a company that stands buy its brand, and I have no doubt that if I have any issues with the Tanuck Mountainsmith, they will be there to get me going again quickly.